CLEVELAND (AP) The Cavaliers’ sleeveless black jerseys already had LeBron James’ stamp of approval, though a change in shoes might have been the difference Friday night. James had season highs in rebounds and assists in his 57th career triple-double. He switched from yellow to black shoes after scoring six points in the first half. For Black Friday, the Cavaliers wore black uniforms. Cleveland also wore black jerseys when it won the first championship in franchise history, but the current edition is minus the sleeves from Game 7 of the 2016 NBA Finals. After Smith split a pair from the line, both teams missed 3-point attempts and Charlotte called time with 11.1 seconds left. Jeremy Lamb missed a 3-pointer after the Hornets inbounded at midcourt and the rebound was tapped out to Kemba Walker, but his 3-point attempt fell well short after James got a hand on the shot. 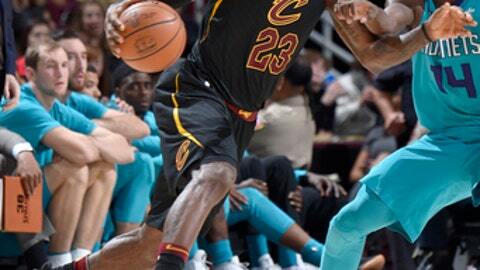 James forced Walker to pass the ball on the inbounds play, but the Hornets had one last chance when after Marvin Williams batted the rebound toward midcourt. Dwight Howard had 20 points and 13 rebounds for Charlotte, which fell to 1-8 on the road. Michael Kidd-Gilchrist and Marvin Williams scored 17 points for the Hornets, whose three-game winning streak ended. Howard’s two free throws and Kidd-Gilchrist’s layup following James’ turnover gave Charlotte a 98-93 lead. James made a foul shot and converted a three-point play, cutting the lead to one. Kidd-Gilchrist hit a free throw but James scored on a drive that tied the game with 1:48 left. Cavaliers point guard Derrick Rose left the team earlier this week to handle a personal matter. Coach Tyronn Lue expects Rose, who has played in just seven of Cleveland’s 19 games this season because of a left ankle injury, to return to the team. Hornets: G Nicolas Batum (bruised left elbow) was unavailable after being re-injured Wednesday against Washington and is day to day. He has only played in five games because of elbow injuries. Lamb returned to the starting lineup in Batum’s spot. … Charlotte’s only road win came against Memphis on Oct. 30. Cavaliers: Rose sustained his injury while driving to the basket on Oct. 20 in Milwaukee. He’s averaging 14.3 points in his first season with Cleveland. … G Iman Shumpert (sore left knee) could return Monday after missing his third straight game. Howard missed all three of his field goal attempts in the fourth quarter, but was 5 of 6 at the free throw line. He was 6 of 9 for the game. ”They double-teamed me when I got the ball and didn’t allow me to get into a good rhythm down the stretch,” he said. Hornets: Host San Antonio on Saturday. Cavaliers: Travel to Philadelphia on Monday.